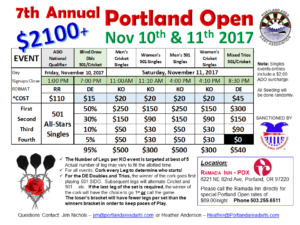 This year’s Portland Open will be held at The Ramada Inn with 16 boards. We will have Widmer beer on tap. The Ramada is excited to be hosting this event and has offered us a special rate of $69 a night for our event. Please make sure to tell them you are with The Portland Open when you book your room. This tournament has been a crowd favorite and grown every year. Help us make this year the biggest yet! This year the payout is guaranteed at $2,100. Friday at 1 pm we will be hosting an ADO 501 All-Stars National Qualifier. The winners from local qualifiers or anyone who pays the entry fee ($110) is welcome to play. Winners of this event qualify to play in Las Vegas in January at the All-Stars 501 Championship being held in conjunction with the Las Vegas Open. Signups close at 12:45pm. The Friday Night big blind draw event is always a lot of fun. This is a great event for first time tournament players and those that just want to have fun playing darts as well as experienced players. You don’t need to bring a partner, we’ll randomly match you up with another player. This is NOT an A/B draw (we will NOT attempt to match players with different abilities). Please note that sign ups CLOSE at 7 pm, and the entry of $15. On Saturday we’ll play all the singles events. Since this is an ADO-sanctioned event, these are the events that will earn ADO points for those interested. All entries for singles events are $20. These are Open Singles events, not requiring you be a PADA or ADO member, or requiring you qualifying. Saturday evening we will hold a Mixed Trios event. This should be another fun event for not only trios, but any others who want to make this a fun, Saturday night thing. If you’re a single or double, we’ll help you find a group. This event will start at 8:30 pm and entry is $45 per team.